Today was one of those decadently lazy days where I had to hibernate indoors because of cold, snowy weather. “Oh darn.” Of course, this meant my kitchen adventures were limited to ingredients on hand. Sipping my morning coffee, I glanced around my kitchen, and there it was. 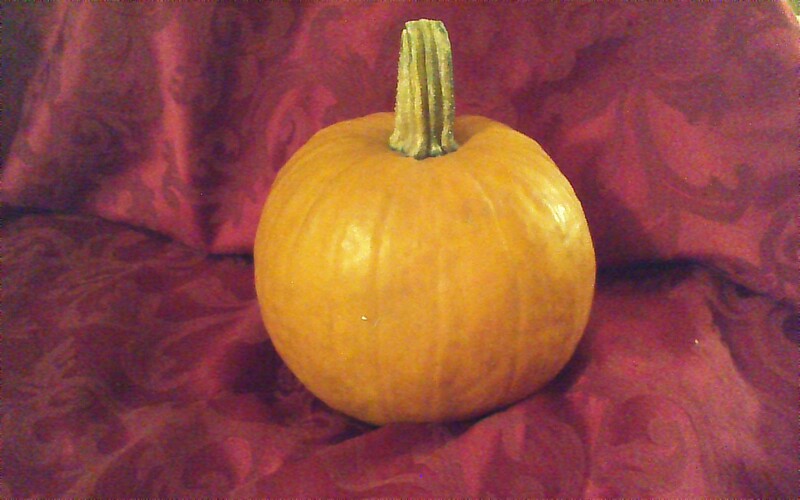 I bought this pumpkin for $2 at a local farm last month. Maybe it was the clean, crisp air surrounding the quaint stone barn stocked with produce, maybe it was the happily barking farm dog running amuck around my feet, I can’t say for sure. All I know is, when I saw the big bin of bright orange pie pumpkins, I was inspired! I brought one home, set it on the counter… and ignored it for a month. Knowing that pumpkins are stuffed full of nutritional gems (beta carotene, vitamin C, vitamin E, potassium, and fiber, to name a few), I resolved to turn mine into something wonderful. As it happened, my pumpkin was bountiful enough for four somethings: Pumpkin Custard, Sesame Roasted Pumpkin Seeds, Petite Pumpkin Scones, and Indian-Inspired Pumpkin Potato Soup. Each recipe is included below. I hope you enjoy them, and I look forward to your comments! First things first: how to make your pie pumpkin look like the stuff in the can! You know what I’m talking about. For me, the big mystery was turning my pumpkin into something that resembled less of a Halloween decoration and more of a supermarket canned good. As it happens, it’s really no mystery at all. Cut, bake, puree. That is ALL there is to it! Step 1: Cut your pumpkin in half and scoop the seeds into a bowl (save the seeds!). Place the hollowed out pumpkin halves in a baking pan, skin side down. I added a halved yam for good measure. Adding a yam will increase your yield, and will brighten the color and thicken the consistency of your final puree. Cover the baking pan with foil and bake at 350 degrees for 60 – 90 minutes or until soft. The time will vary; check after 60 minutes. 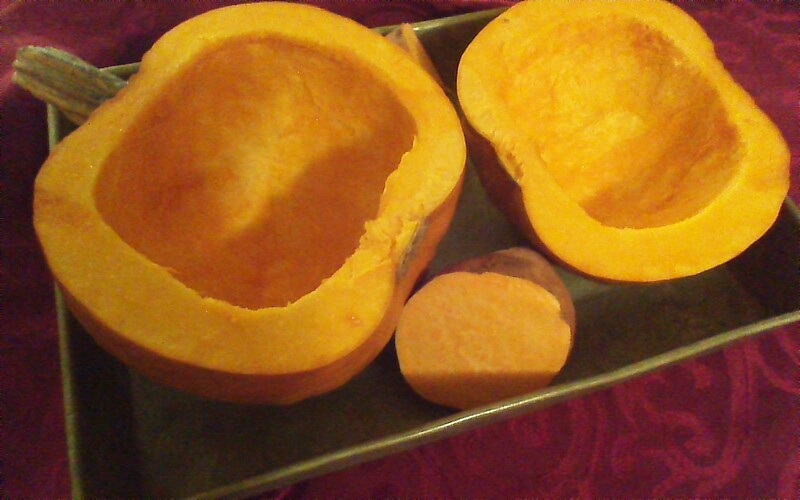 Step 2: When cool enough to handle, simply scoop the baked pumpkin and yam out of the skins* and into a bowl. Scrape the skins well, to get every speck of pumpkin! Then, puree with an immersion blender. Voila! Yields will vary; I ended up with 5 cups of puree. So easy. Why I have been buying cans of pumpkin for so long, I will never know. 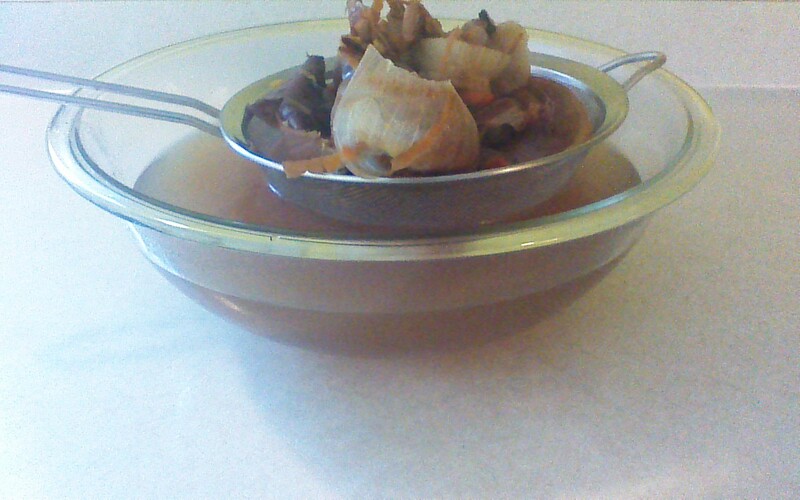 *Save the skins – just put them in a bowl in the refrigerator and forget about them for a little while. Trust me on this. Crowded Earth Kitchen wastes nothing… we will put those pumpkin skins to good use later! My kids LOVE pumpkin custard. Essentially, it’s like eating pumpkin pie without the crust… loads of vitamin-packed sweetness without loads of saturated fat. Ladle mixture into 8, 1/2 cup oven-safe ramekin dishes arranged on a large baking sheet. Don’t overfill; custard will rise about 1/2 inch while baking. Place baking sheet in preheated 400 degree oven. After 15 minutes at 400 degrees, reduce oven temperature to 350 degrees and continue baking for another 30 minutes. Remove from oven, and try to let cool before devouring! Please don’t throw those pumpkin seeds away. Mother Nature knew what she was doing when she tucked those seeds inside of your scrumptious pie pumpkin! Pumpkin seeds are a nutritional powerhouse food, containing protein, iron, zinc, and a whole host of trace minerals in their humble little shells. I roast the seeds from everything in the squash family – not just pumpkins. I store them in the freezer, add them to my kids’ school lunches, and use them to garnish winter soups. While your pumpkin custard is baking, separate the pumpkin seeds from the “goo” scraped from the inside of your pie pumpkin. Give your pumpkin seeds a good rinse in a strainer bowl. Spread 1 Tablespoon of sesame oil on a 9 inch baking sheet with shallow sides (a 9×13 cake pan would work), and scatter your pumpkin seeds over the oil. Sprinkle with 1/4 teaspoon each: sea salt, coarse ground black pepper, paprika. Place pan in 350 degree oven (with the pumpkin custard is fine) for 30 minutes, stirring after 15 minutes. Done! These not-too-sweet scones are just the right size for enjoying with a cup of soup (below) or pairing with a cup of afternoon tea. Their aroma, wafting from your oven, will make your kitchen smell fantastic! These scones freeze well, and make a fun lunchbox item. Combine first five ingredients in a large bowl until well blended. 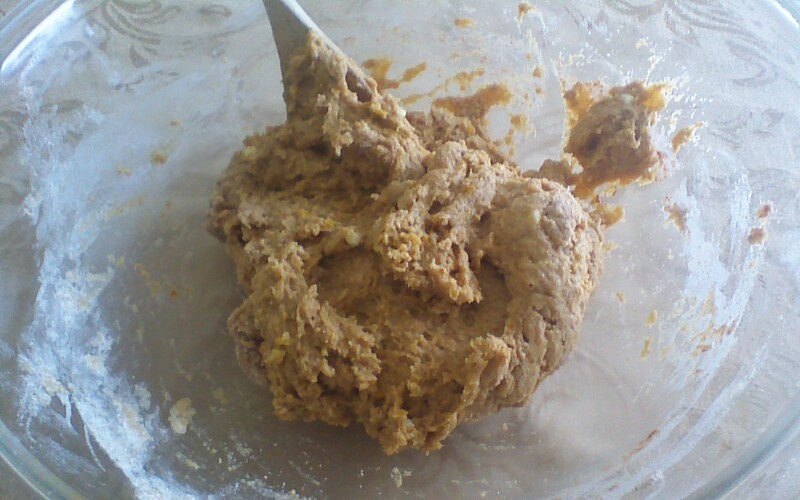 Add dry ingredients, and mix just long enough to form a soft dough. 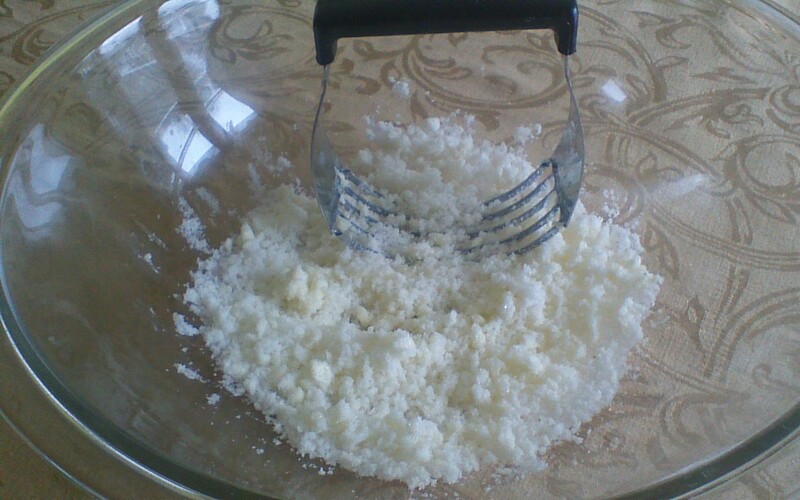 Remove dough from bowl and place on a counter dusted with 1/4 cup of white flour. Knead dough for a few minutes, turning over the dough occasionally and adding more flour if the dough feels very sticky. 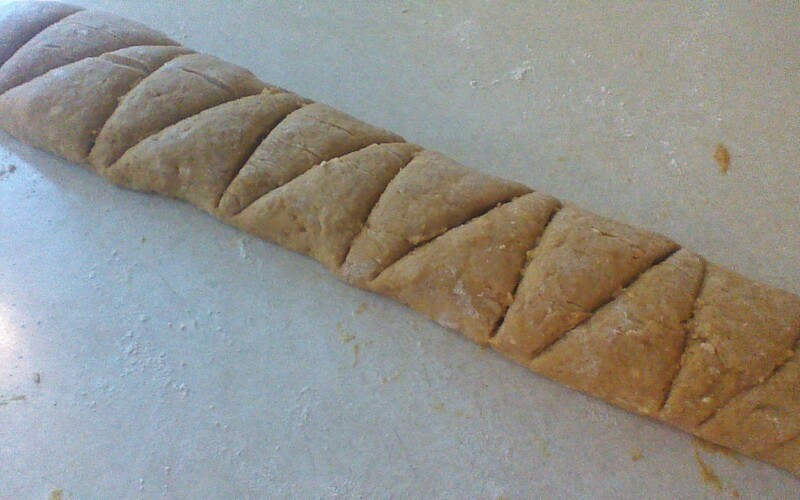 Shape the dough into a long rectangle, approximately 3 inches wide and 1 inch high. 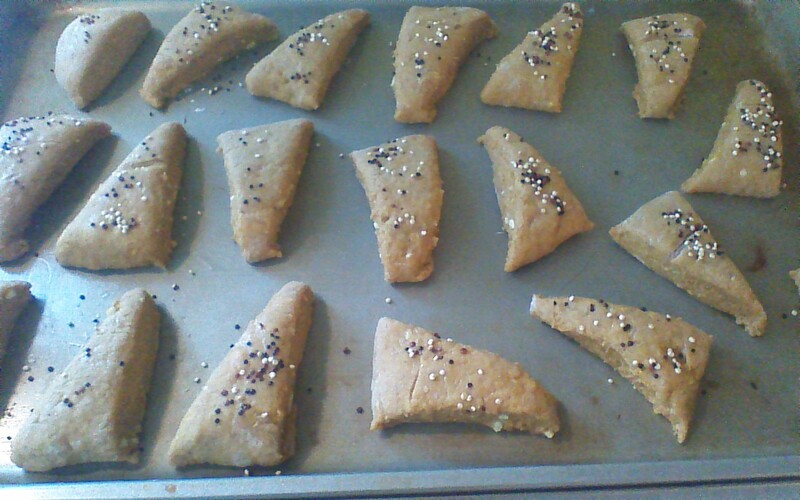 With a butter knife or a spatula, cut a “zig zag” pattern into the dough so that you will have 18 wedge-shaped scones. Bake for 10 – 12 minutes at 400 degrees. Delicious! Remember those pumpkin skins you tucked away in the refrigerator? Now’s the time to go and get them! Also, get your scrap container from the freezer… you know, the one with the carrot peels, celery bottoms, onion skins, and other vegetable scraps you’ve been saving. Wait… you’ve been throwing those away? Don’t fret. Take a few minutes to gather a cup or two of vegetable scraps from your refrigerator. Trim the carrots and celery lurking in your crisper drawer, peel the forgotten onion you just found… anything goes. In the FUTURE, remember to save all of your vegetable scraps in a freezer container, because Crowded Earth Kitchen wastes NOTHING! We’re going to start by making vegetable broth. This process is as easy as it is cheap, making homemade vegetable broth a Crowded Earth Kitchen staple! Simply add your pumpkin skins and vegetable scraps to a large pot, and just barely cover with water. If you’re feeling really exotic, you can throw in a bay leaf or some freshly ground pepper. It’s up to you. Bring your pot to a boil and simmer, covered, for one hour. Next, strain your broth through a sieve into a large bowl (or into another pot). It may be helpful to scoop out the large pumpkin skins with a slotted spoon before pouring everything through a sieve. Add the vegetable scraps to your garden compost bin, and let’s use that wonderful, vitamin packed broth! You’ll need 4 cups for this recipe. If you have extra, freeze it for the next time you need any sort of broth. I leave my broth unseasoned, and adjust individual recipes as needed. Bland is fine, at this point. Bring everything to a boil, reduce heat, and cover. Simmer until potatoes are soft. 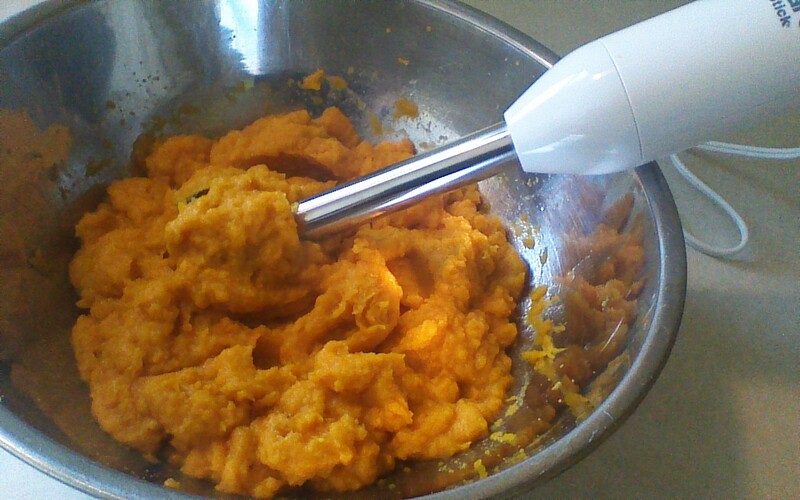 Puree with an immersion blender and enjoy! I’m pleased with the four different ways in which I put my pie pumpkin to good use, and hope you are inspired to pick up a pie pumpkin of your own! Crowded Earth Kitchen welcomes your feedback… please post your comments and questions below! 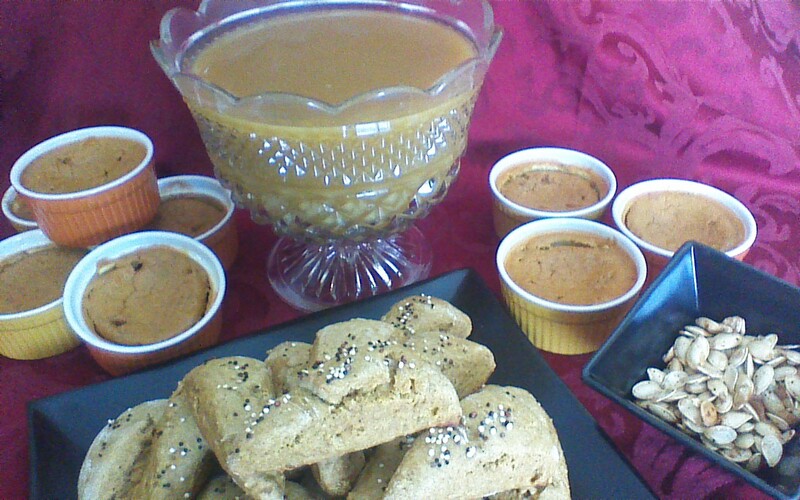 This entry was posted in Breakfast, Desserts, Fruits and Veggies, Lunchbox Treats, Soups and Salads, Vegan, Vegetarian and tagged Indian-Inspired Curry Pumpkin Potato Soup, Petite Pumpkin Scones, Pie Pumpkin, Pumpkin Custard, Sesame Roasted Pumpkin Seeds. Bookmark the permalink. It is almost as if you looked in my freezer and noticed the entire pumpkin I pureed back in November and promptly forgot about. Thanks for the recipes! I shall put them to good use! Your recipes make me want to run out right now, at 11:30 P.M., in my pajamas, and find a store with pie pumpkins so I can get cooking! Can’t wait to try that soup.